If you’re looking for a convenient and space-saving solution for your home gym needs, consider a Bowflex. Their all-in-one design philosophy promotes a total body workout, making it super easy to switch up exercises and reducing the total amount of equipment you need. In this piece, you’ll learn everything you need to know about the best Bowflex home gym for your workout needs. A wide variety of features and a user-friendly, beginner-friendly design all make this our top choice for you. One of the only home gyms that supports over 100 different exercises, creating an intense full-body workout. A great option if you’re budget conscious and still want a home gym that can work your entire body. The alternative model to consider if you want the versatility from over 60 different exercises. This home gym is built to last when you’re working out frequently at intense levels. Has around 25 exercises with a total of 200 pounds of resistance. Convertible bench for aerobic rowing workouts. Pulley system is customizable for different exercises. Spiraflex resistance technology creates safe resistance without inertia. Fully-customizable arms for many different exercise positions. Supports up to 600 pounds of resistance on a leg press. Stable, commercial-grade steel frame, cushioned back pad, hand grips, and sling straps. Everything is customizable for the ultimate bodyweight workout. Power Rod resistance supports up to 210 pounds of resistance. This can be upgraded to 310 or 410 pounds. Comes with a lat bar, squat bar, and triple-function hand grips and ankle cuffs. 210 pounds of upgradeable resistance from the Power Rods to switch up resistance quickly. Comes with an ab training strap, a squat bar, a lat bar, and 5-way hand grips and ankle cuffs. 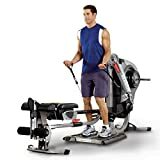 Doesn’t support as many exercise variations as some other Bowflex models. The large number of exercises and extensive customizability drive up the price. Works on body weight alone. If you’re looking for more resistance, this isn’t the model to consider. The cable and pulley system can make switching between exercises a little rough and slow. The cables tend to get a bit twisted after heavy use, making exercise more difficult. Why Buy a Bowflex Home Gym? Great for working your muscles. A Bowflex home gym is a great tool for a full-body workout since it uses the same weight increments as lifting weights. If you’re used to lifting free weights or using other weight machines, the Bowflex lets you lift those same weight amounts. Low impact. A great benefit of using a Bowflex home gym is the small amount of impact on your joints. With a Bowflex, there is less joint impact than with traditional weightlifting, a huge plus if you’re prone to injury. Tone, tone, tone. The many workouts possible on a Bowflex keep your exercise routine fresh, challenging different muscle groups and toning up your entire body. The customizability of a Bowflex home gym workout is ideal for avoiding plateaus. Control is key. A Bowflex has the added benefit of allowing you more control over how your muscles move, thanks to the built-in pulley system. Compact, all-in-one system. The all-in-one nature of these machines means you’ll need less equipment than a more traditional gym. The compact design can even fit into smaller rooms, making a home gym possible if you’re tight on space. Invented by NASA to train astronauts, Spiraflex technology is a great option found in some Bowflex home gyms. It uses spinning plates that create resistance through their motion, which keeps each rep smooth and consistent. The design is more compact than other Bowflex models. Body Tower adjustable bars use gravity for resistance. These are a basic budget option for simple exercises. You still get a good workout, but you’re limited to only your body weight. This limitation might make it more difficult to get over the occasional fitness plateau. If you’re serious about lifting, a Bowflex home gym with a customizable weight system will be a better fit. Around $300: The main price point of the Bowflex Body Tower. Compared to other, more expensive models, this Bowflex home gym doesn’t come with any accessories or fancy bells and whistles. $499-$999: This is the low-to-mid range of Bowflex home gyms. For the price, you’ll find the Bowflex PR-line range. These machines use the Spiraflex technology to generate resistance, creating a range of weights and exercises. Around $1,000: This is the mid-range of Bowflex home gyms, home to the Bowflex Xtreme 2SE with its Power Rod technology. Around $3,000: The high-end of the price range where the high-quality Bowflex Revolution hangs. This machine uses Spiraflex technology to offer hundreds of pounds of resistance for the most extreme workouts. Attachments for leg extensions and other accessories are available. The type of resistance affects how the machine feels and what kinds of workouts you can do. 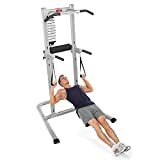 Depending on the exact model, the resistance mechanism will either consist of a pulley system that connects the weights to the handles, interchangeable resistance rods, and plates, or your own body weight. Some gyms have cushioned seats for more comfort. These seats are usually adjustable to fit your body size and make the workout as efficient and low-risk as possible. In many Bowflex gyms, the bottom seat moves out of the way for standing exercises. A number of Bowflex gyms will have hand grips and/or ankle cuffs. These connect the wrists or ankles to the machine for different workouts, allowing you to keep your whole body toned. 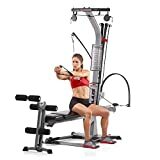 For extra convenience, there are a number of attachments and upgrades you can buy like a flat pull-down bar, an ab harness, and a leg extension attachment to train quads and hamstrings. Some higher-end models also have a multi-pulley design that eliminates the need to reposition handles or cables for different exercises. On lower-end models, you can add a Power Rod upgrade to increase the maximum weight capacity of the gym. Bowflex home gyms require basic assembly and often include the most basic tools required. You may need some screwdrivers and adjustable wrenches, however. On average, the time to set up a Bowflex home gym is about one to two hours. Warranties vary somewhat depending on the home gym you buy. The machine itself often includes a one-year warranty. Warranties for rods and parts last for five to seven years and 60 days respectively. Exercise diversity: Each Bowflex model has a specific number of exercises you can perform. The more higher-end models are more complex and support a greater variety of exercises. Space: If you’re short on space, a budget model will take up less room than a higher-end model due to its design. Maximum weight capacity: Budget models have around 210 pounds of max resistance and an upgrade package of 310 pounds. High-end Power Rod models go up to about 410 pounds. The Spiraflex system starts at 220 pounds and includes an upgrade to 300 pounds for the upper body and 600 pounds for the lower body. The PR1000 is our pick for the best overall Bowflex home gym, thanks to its many features and user-friendly design. 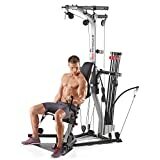 Offering 25+ exercises, this machine is great for working on your entire body. A total of 200 pounds of resistance lets you lift a lot of weight, making the typical plateau a thing of the past. A nice feature of this home gym is the bench that converts into a rolling seat for cardiovascular fitness during strength training. The gym also comes with a built-in media rack. Finally, the pulley system creates a variety of latch positions, increasing the flexibility of the machine. This level of customization makes the PR1000 a winner. The only downside to this machine is it doesn’t support as many exercises as a more expensive model. You can still work your entire body on this machine, but you may be limited with the types of workouts you can do. The Bowflex Body Tower is a great option if you’re budget conscious. The premise of the Body Tower is fairly simple: work out with your own body weight. The frame’s design creates approximately 20+ exercises you can do with this setup. The frame is made from stable, commercial-grade steel, and the back pad is fashioned from non-absorbent foam. Hand grips and sling straps come with the setup, and the entire tower takes up very little space. The obvious downside to this home gym is the limitation of body weight. If you want more resistance, you won’t get it. If you’re someone who prefers an exercise challenge and lots of variation, a Power Rod or Spiraflex model will be the better bet. The Bowflex Revolution is one of the only home gym machines that supports over 100 different exercises for an intense, full-body workout. The Spiraflex technology works independently of gravity to generate resistance. The arms adjust to ten different positions covering around 170 degrees of arc. This home gym lets you work with up to 600 pounds of resistance on the leg press station for serious lower body weight lifting. A vertical bench press station expands the range of exercises and folds up for storage, while a sliding seat rail promotes aerobic exercises like rowing as well. One of the drawbacks here is obviously the price point. It tops out as the most expensive Bowflex available. Additionally, the resistance is only adjustable in ten-pound increments, making it difficult to reach your blow out zone. The Blaze is a great choice if you want versatility and customizability. Resistance comes from the Power Rod system, giving you 210 pounds of resistance and creating over 60 different exercises. The weight capacity is upgradeable to 310 or 410 pounds. A sliding seat rail allows you to perform leg presses and aerobic exercises like rowing. The multi-cable pulley position system offers a lot of customization for your workouts. A lat bar, squat bar, and triple-function hand grips and ankle cuffs also come with the set. The bench and wheels fold up for easy storage. Switching between exercises can be a bit of a pain due to the pulley and cable system. Since you have to connect the cables to different rods to alter the resistance, it may be difficult to keep your heart rate up if you’re shooting for circuit training. As the name suggests, the Xtreme 2SE is built to last. A heavy-duty steel frame offers long-term durability, while an ergonomic, adjustable seat with high-density foam keeps you comfortable during workouts. With this machine, you can do over 70 different exercises to really work your entire body. In terms of resistance, you get a Power Rod system with the standard 210 pounds (upgradable to 310 or 410 pounds) and a multi-cable pulley system to customize workout positions and limit your downtime between exercises. It comes with an ab training strap, a squat bar, a lat bar, and 5-way hand grips and ankle cuffs. The main downside of this machine is that the cables tend to get twisted after a lot of use. Some untwisting may be necessary between different exercises to keep everything organized. Make sure to keep the machine in proper working condition to avoid a safety hazard and possible injury. Buy workout gloves to protect your hands from the handles and other surfaces. Use a Power Rod machine with more reps for better endurance work. Thoroughly inspect your machine once a month to keep it in the top and safe condition. Remember to wipe down your machine after every workout using a non-abrasive cleanser. Start gradually with the Bowflex to avoid injury, as there may be a learning curve to using the machine properly. Q: What accessories do I need for a complete workout? Q: Does the Power Rod design offer the same feel as free weights? A: Not entirely. While the Power Rod does provide a great workout experience, using the rods isn’t the same as using free weights. Free weights push and pull your muscles as you move through the rep, while the Power Rods just pull. Q: Can the home gym disassemble quickly for moving around? A: You can disassemble a home gym, but the process isn’t as quick as moving an elliptical, for example. You have to take into account the reassembly time, so the whole endeavor could take an hour or more. Q: What’s the advantage of a Bowflex home gym over free weights? A: The unique design of the Bowflex system allows you to lift heavy weights with little inertia. The overall workout is just as effective as a free weight workout but safer. Also, the Bowflex allows you to complete a wide variety of exercises you’d need more free weights to do otherwise. Bowflex home gyms are great machines for toning up without having to leave the comforts of home. For our overall winner, we selected the Bowflex PR1000 Home Gym. It has plenty of features and a user-friendly design that will make it fun to use. If you’re looking for something a little more budget friendly, we recommend the Bowflex Body Tower. You can get a full body workout with a compact, easy-to-use machine. What do you think of our picks? Do you have a favorite Bowflex machine? Let us know in the comments below!